One of the jobs that changes daily is our meeting manager. After breakfast and the school-wide morning news show, we kick off our day with a morning meeting. For the first six weeks or so of the year I was in charge of that. We learned different greetings, practiced sharing with each other, learned a variety of activities, and read and interacted with our morning message. Once we were solid in our morning meeting each day the job of running that piece got turned over to the kids. This morning the awesome kid above was our meeting manager. As soon as the news show ended she was ready with the greeting she had chosen. After that she looked around for anyone who wanted to share (no one did which is pretty typical for Fridays because all the kids who like to share have already shared earlier in the week and they can only do so once each week). She started the activity. 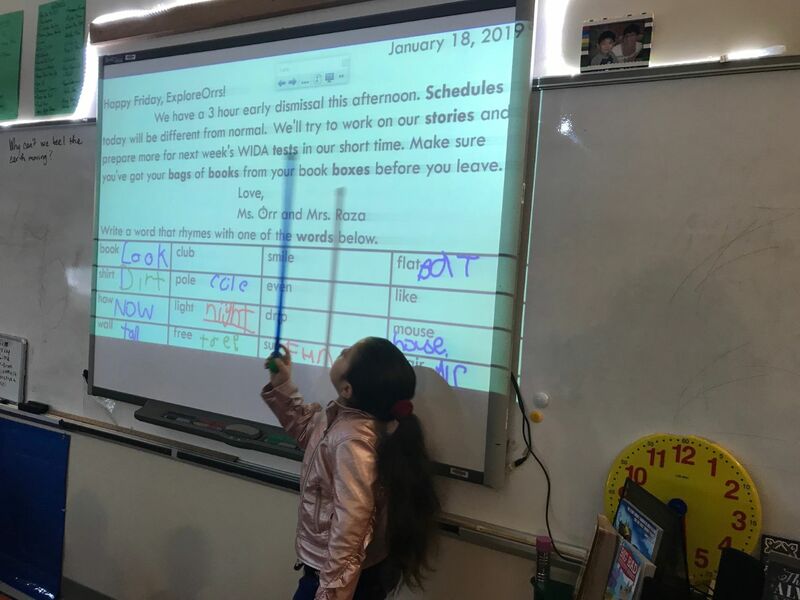 Finally, she got the pointer to lead our morning message. Leading the morning message is the most challenging part of being meeting manager because it involves pointing at the words as others (and hopefully you) read the message. That’s a bit stressful for some kids because they go too slow or too fast and everyone gets off track. It’s also challenging because the pointer isn’t long enough to reach all the way to the other end if one stands to the side. So the kids have to walk a bit after the end of each line and their classmates don’t always wait for them to get to the next line before reading. This girl had a different plan. She planted her feet right where she is, stretched hard to get to the far side, and leaned way over backward to get to the text behind her. In three years of having kids do this I have never had one do it quite that way. I’ll be curious to see if others copy her in the future.